While these new Code Blue grips are not made by Channellock, they are made by a company just down the road from Channellock in Meadville, Pennsylvania. I am sure this is a welcomed move by not only us tool users, but also by the number of jobs this has helped. 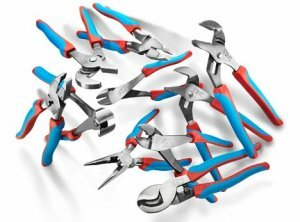 You can now find a number of Channellock's popular pliers sporting the new Code Blue handles which feature an improved grip design, and Channellock plans to further expand the line in 2013. If you are a fan of Channellock but would like a handle with a bit more grip, check out the new Code Blue. P.S. This further goes to show that if Channellock can make hand tools here in the USA, other brands can do the same.